2012: Responsibility of care and maintenance for the fountain was transferred to the city in 2012. 2013: The warranty expired and then the fountain quit working. 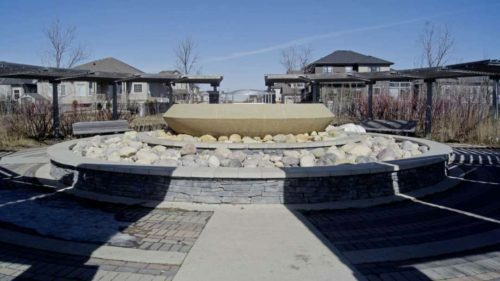 There was significant debate on who would fix the fountain – Manitoba Housing or the City of Winnipeg. 2015: Having just been elected in Oct 2014 – I set out to have clarity on what the repair issues were. Still there was much back and forth between Manitoba Housing and City Parks Department as to who would fund repairs. I gathered a high level estimate of the cost from Parks Department, that something in the range of $100K would provide enough funding to investigate issues. 2016: I secured $100K in the City budget to initiate repairing the fountain. I worked with Manitoba Housing and secured some additional assistance in repairing the fountain. 2017: Repair work started and it was determined that the ‘holding tank’ (located near the pump house) had sunk and the pipe connecting the holding tank to the fountain – had broken away therefore ending the flow of water. Extensive work occurred to restore the tank from its ‘sunken’ location and to fix the connecting pipes to the fountain. During this time of repair, the ‘fountain jets’ were stolen and remaining ones vandalized. Special jets had to be order from an overseas supplier. Jets were installed and fountain started running again. The fountain was then up and running – BUT a few weeks into the fountain running – another leak in the pipe was discovered – and repaired. Also during summer of 2017, general maintenance occurred removing overgrown shrubs and weeds, and the entire bricking at the base of the fountain was reset as the bricks had all shifted. Water consumption records were kept throughout the 2017 season. 2017-2018 Winter: Water consumption records were analyzed and the department believed there was still a leak somewhere due to volume of water being used – as compared to what Fountain Manufacturing Company stated what volume of water use should be. 2018: A structural engineer was hired by the Parks Department to analyze the fountain to determine if the structure was intact and things weren’t ‘sinking’ causing more shifting and cracks / broken seals – which would cause leaking and an increase in water use. Throughout the summer the fountain has been on and off for very short spurts for testing. I am told by the Park department the report will be coming forward mid-August. Trees were removed during the investigative work and repair of the tank – and will be replaced once the final solution is determined – as more excavation work may need to occur to fix the fountain once the report is presented. If the structural engineer’s report states the fountain has a leak under the structure that can’t be fixed unless the fountain itself is ripped up – we as a neighbourhood will have some serious decisions to make. City Parks staff have told me they will not support the fountain being ripped out to repair structure underneath but instead would offer to plant flowers in the fountain. I have a very hard time with their position on this. If the fountain has to be ripped out for repair – it is essentially installing a brand new fountain. As a community – we will have to discuss – is this where we want another fountain – or do we want to relocate the fountain to another area – do we want the same fountain – or would we consider a spray pad or different water feature. I am adamant about keeping a water feature of some kind – fountain – spray pad or whatever in Bridgwater Forest. BUT – on the up side, the structural engineer’s report could say all is structurally sound – and there are just issues related to hosing and piping that require patching. Or something along those lines that are not structural issues. So – I have great anticipation and trepidation as I wait for the structural engineers report.